Fortnite Battle Royale has recently made the leap onto mobile platforms. Currently, in early access for iOS devices the game topped the Apple Store charts around the world and now is making millions of dollars. According to Sensor Tower, which cites data from its Store Intelligence platform, Fortnite made $1 million within 72 hours of becoming available on iOS devices. This through selling cosmetics skins using premium currency. This should've come as a surprise considering the game is insanely popular. 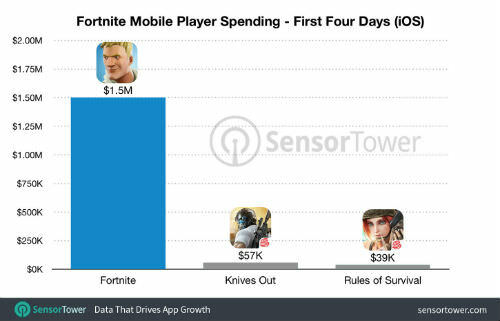 Sensor Tower also added that Fortnite is doing better than other mobile hits such as Pokemon GO which made $4.9 million in 4 days and Clash Royale which made $4.6 million in the same period. Fortnite has a headstart but with PUBG now available on both iOS and Android devices for free perhaps that number won't be rising as quick. Fortnite is available now in early access for iOS, PC, PlayStation 4, and Xbox One, with Android support coming in 2018.